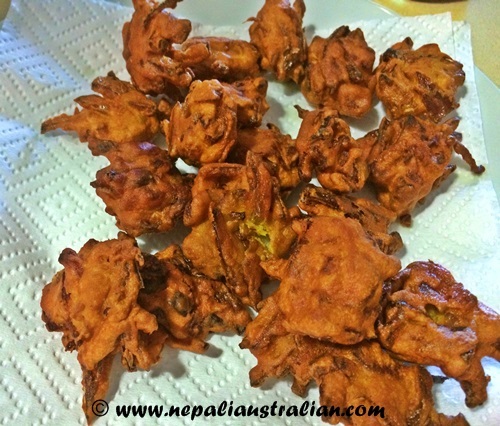 As you know mums love to cook and my MIL is no exception so when she was here we got to eat a variety of Newari and Nepali food like Yomari, Haluwa, aloo chops and she also made Pyaj ko pakoda. 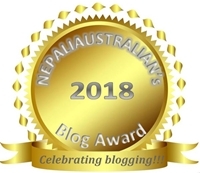 Pyaj means onion in Nepali. The process is very simple and I am sharing the recipe here. 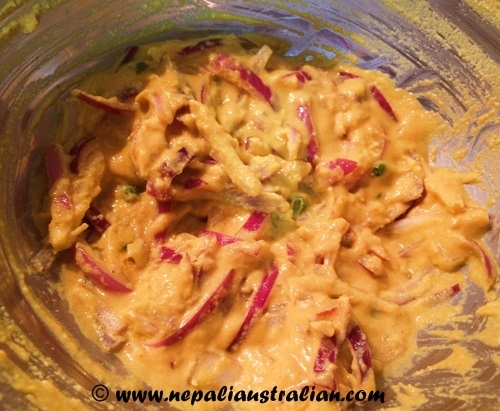 In a bowl, mix sliced onion gram flour, rice flour, ginger, red chilli powder, coriander leaves and salt. Add ¼ cup of water and mix well and keep aside for 5 minutes. The onion pakoda batter is ready to be fried. Do not add more water unless required otherwise pakodas will not turn crispy. 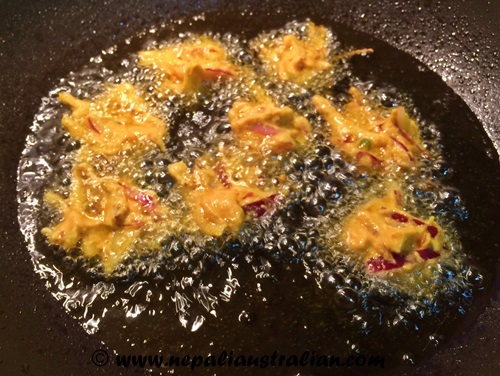 Heat oil in a deep pan (or wok) and take a handful of batter mixture in the hand and gently drop 3-4 small fritters into the oil at a time and deep fry. Fry the onion pakodas, till they look crisp and golden on both sides (once the underside is golden brown turn them over so both sides are golden). Repeat the process for the remaining batter and deep-fry in batches. Remove them with a slotted spoon and drain them on the kitchen paper towels for excess oil to be absorbed. Serve onion pakodas with your favourite sauce. 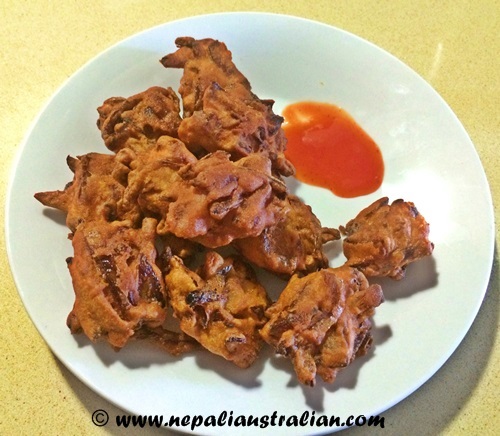 This entry was posted in Foodie, Nepali food, Newari Food, Recipe and tagged gram flour, nepali food, nepali snacks, Onion, onion pakoda, onion reci[pe, Pyaj ko pakoda, snacks, vegetarian. Bookmark the permalink.